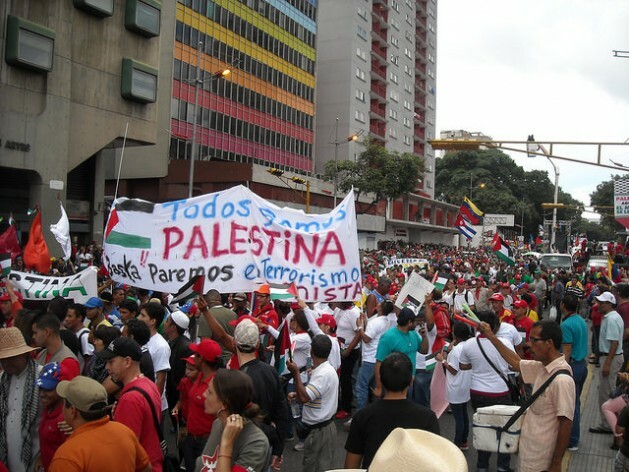 CARACAS, Aug 7 2014 (IPS) - Latin America is the region whose governments have taken the firmest stance in support of Gaza in face of the battering from Israel, withdrawing a number of ambassadors from Tel Aviv and issuing harsh statements from several presidents against the attacks on the Palestinian people. But some experts say that paradoxically, this solidarity has kept this region from playing a decisive role in the international attempt to curtail or resolve the conflict. “It would be good to take advantage of the geographical distance and the relations with the people of the Middle East to curb the confrontation,” Elsa Cardozo, former director of the Central University of Venezuela’s School of International Studies, told IPS. Latin America “also has the authority of being a region free of religious conflicts or conflicts revolving around the existence of nations, which puts it in a position to pronounce itself, for example, with respect to Israel’s horrendous attacks on civilian Palestinian targets,” Cardozo said. But “its militant a priori side-taking undermines the region’s authority to pressure the two sides, because that authority isn’t gained by being biased but by condemning every action of each actor that violates basic rights,” she added. Since Israel launched Operation Protective Edge on Jul. 8, bombing the Gaza Strip, the governments of Argentina, Mexico, Nicaragua and Uruguay have issued statements condemning the bombing, and the Foreign Ministries of Brazil, Chile, Ecuador and Peru recalled their ambassadors from Tel Aviv for consultations. As far back as Israel’s Operation Cast Lead against Gaza in late 2008, the governments of Bolivia and Venezuela broke off ties with Tel Aviv, while Cuba severed relations in 1973 and Havana has been at diplomatic loggerheads with Israel and has offered open support to the Palestinian liberation movements. The declaration also included a condemnation against any attacks on Israeli civilians, and was signed by presidents Cristina Fernández (Argentina), Dilma Rousseff (Brazil), José Mujica (Uruguay) and Nicolás Maduro (Venezuela). President Horacio Cartes of Paraguay, another member of the bloc, abstained. During the first four weeks of the war on Gaza, at least 1,830 Palestinians, three-quarters of them civilians, and 67 Israelis, including 64 soldiers and three civilians, have been killed, according to statistics gathered on the ground. 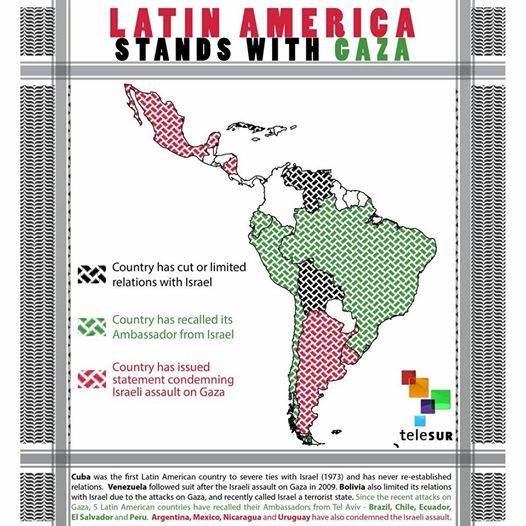 In this region, marches and protests in solidarity with Gaza and the Palestine cause have been held in Argentina, Brazil, Colombia, Costa Rica, El Salvador, Mexico, Nicaragua, Panama, Venezuela and other countries. On Jul. 29, Bolivian President Evo Morales announced that his country was putting Israel on its list of “terrorist states” because of the “genocide” and inhumane attacks on the civilian population in Gaza. “Everyone has the right to defend themselves, but there are defences that have a limit, that you can’t do, such as bombing hospitals, children and the elderly,” Mujica said. In addition, Venezuelan Foreign Minister Elías Jaua announced Aug. 6 in Cairo that Venezuela would ship 16 tons of humanitarian aid to Gaza via Egypt, and send funds for the purchase of 15 ambulances, as well as 240,000 barrels of fuel for the rest of the year, based on agreements that will be managed by PetroPalestine. The minister’s trip to Cairo had the aim of coordinating the aid, reiterating Venezuela’s commitment to the Palestinian population, visiting refugees who have fled the bombings into Egypt, and reasserting his country’s offer to take in Palestinian children orphaned in the last month. In addition, in the United Nations, where it is a candidate to a non-permanent seat on the Security Council for the 2015-2016 period, Venezuela “can contribute to international efforts that could bring about a change in the current dynamic, but to do that it should avoid taking biased stances in this conflict,” Ramírez said. Milos Alcalay, a former Venezuelan ambassador to the U.N., pointed out to IPS that “in the global organisation, Latin America has always supported the establishment of two states, since 1947, one Israeli and the other Palestinian, unlike Arab countries, which wanted only one state to be formed. “Unfortunately that balanced position is being pushed aside, and the opportunity for an understanding with all of the parties in the conflict is being lost,” said Alcalay, who is also a former deputy foreign minister. Latin America “should send a message that it mourns all of the dead, that it condemns Israel’s military actions and the provocations by extremists opposed to it, always with the aim of achieving and bringing about a ceasefire and a path to peace,” he added. “There aren’t any valid state interlocutors left to mediate, in large part because they are actors who failed in their attempts at mediation and who have taken polarised positions with respect to the conflict in Gaza,” Andrés Serbin, president of the Buenos Aires-based Regional Coordinator of Economic and Social Research (CRIES), told IPS. Given the failed mediation by the states and the U.N., “the alternative is that of civil society actions. The first efforts focus on early warning systems and prevention, and given the escalation of violence like what we are now seeing in Gaza, initiatives of citizen diplomacy and campaigns aimed at reopening the dialogue,” Serbin said.